Things did not get off to a good start as I travelled to Hay-on-Wye this week. I arrived at Hereford railway station to be greeted by – nothing. No sign of the car meant to be picking me up to take me to Hay, only another woman looking equally anxious. A few minutes later the driver emerged from behind us in the station. Both us women had failed the first test – looking everyone standing at the barrier in the eye to see if they were our driver (that seemed to be what he had expected of us). At least it was only a brief moment of anxiety. Unfortunately things did not get better when I got to Hay. Nothing wrong with the B+B I was being put up in; it was delightful and comfortable and I was greeted by a lovely, friendly woman. No, the problem arose when I tried to put the key in my bag (a large bag suitable for transporting my laptop to the venue) only to find my supper of a Pret yogurt and muesli concoction had shed its lid in transit and was now liberally spread over the laptop connector, my glasses and the lining of the bag. I’ve had worse accidents in luggage. By comparison with the lid coming off a small tin (yes, tin, this was a long time ago) of Nescafe in my rucksack when youth hostelling round the Highlands on a day when there was torrential, incessant rain was definitely worse. A rucksack full of liquid Nescafe can make a mess of all one’s dry clothes. Yogurt travels less far, less fast – although any remnants left may get a bit smelly in a few days of summer’s heat. So why was I in Hay? I came here 6 years ago to participate in a Festival, but not ‘the’ Festival. I came before to speak in what was called a Philosophy Festival (How the Light Gets In) and, as the post I wrote about it at the time made clear, I was not terribly impressed by what I found. I came to Hay last autumn, purely for a holiday and I think I felt the benefit of it. This time, my visit to Hay was to speak at the Literary Festival – which I would deem ‘the’ Festival – now celebrating its 30th year. The tent, the next morning, was not quite packed but I’m told around 400 had registered (or rather, paid) to come, and that looked about right. As comedians would say, a lovely audience who laughed in all the right places. Nerves vanish, of course, once you get going – particularly if you feel the audience is on side. This is hard to judge until a few minutes in. As I have written before, audiences and dynamics vary in ways that are hard to anticipate, but a warm audience undoubtedly will bring out one’s best (and a cold one may lead to an ever-worsening performance). My talk was not a standard one of mine, given that the audience was very different from my regular fare. I’d given the title ‘How Cultural Stereotypes Damage Innovation’ so I was moving a little outside my comfort zone (always to be encouraged; it keeps one on one’s toes). I won’t rehearse the arguments in this post, but you can find an interview I did on the back of it here (though you may have to wade through a few irrelevant pages first to get to the actual interview). There were a plethora of hands thrust into the air at the end of the talk, far too many questions for me to answer before I had to hand the platform on to the next speaker. Interestingly, although I’m sure there were plenty of men in the audience (I hadn’t ‘checked’), every single question came from a woman. Thoughtful probing questions, although I was slightly taken aback to be challenged whether my university should take steps to stop the promulgation of Simon Barron Cohen’s research on the extreme male brain. I am very obviously not a neuroscientist, but I personally think Cordelia Fine, in her book Delusions of Gender, has done a good job of critically analysing some of his experimental methods. Nevertheless I do not believe the University should start ‘censoring’ serious research. I came away from Hay absolutely drained. It had been a real performance, as talking to large audiences always is in my experience, be they undergraduates, the public or whoever. I came away wishing I didn’t have to rush back to Cambridge to mark exams. Maybe another year I’ll get to go back and spend longer at the Festival, avoiding exploding yogurt pots en route. In the meantime I leave you with a few images which illustrate why I believe, not only do stereotypes damage innovation, but we are moving in the wrong direction in the way we interact with children and encouraging children to consider diverse roles. 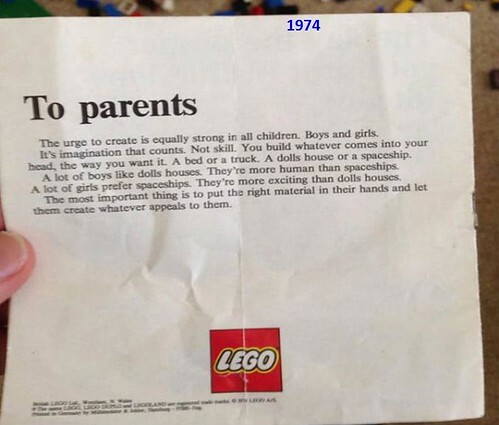 Text to be found in a 1974 Lego box – encouraging diversity of play! 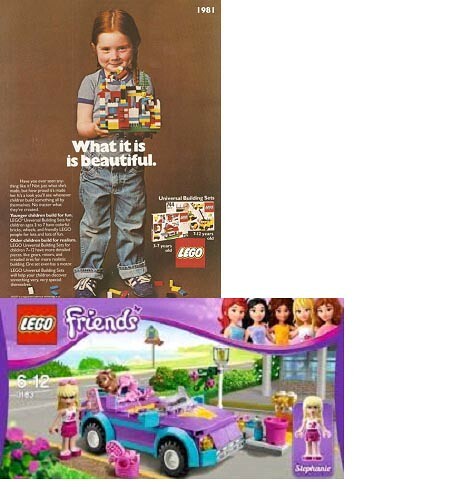 Compare Lego ads from 1981 and current…. This entry was posted in Communicating Science, Equality, Uncategorized, Women in Science and tagged audiences, gender, Hay Festival, Lego. Bookmark the permalink. From the Guardian article, most striking was the claim that 90% of Lego’s customer base was male in 2011 (I wonder how this compares with 1981). The ensuing paragraphs on research and marketing relating to Lego Friends were interesting to me as someone with a daughter who is mad on them (although she does also build structures with the generic bricks). As a mother and a scientist, I have mixed feelings about LEGO advertising and diversity. For a while I was worried about the LEGO being gender segregated to the LEGO friends and at the same time the City LEGO being much more boy oriented. However, the reality of my 5-year-old son and 7-year-old daughter building with LEGO is very much mix and match approach. For the 7-year-old the Friends were the entry to the LEGO world (as otherwise it was all aeroplanes and fire engines), but now she builds with whatever, including the bricks from the 80s that are in huge box. The children still have the same strong imagination than they had 30 years ago and that should be trusted. Even the Friends pieces are still bricks and can be turned into anything. She has really had to think hard about accessibility, and has designed houses with ramps and extra wide doorframes, because the wheelchair does not fit the normal frames, as well as thinking about how the playground can be used in a wheelchair. She also borrows whatever she sees in the world into her buildings, for instance has a female couple ‘the aunties’ living in a camper van, as totally normal part of the game. So, it seems that it is the diversity in the world around her, but also in the LEGO box that is important, but despite the marketing, the strongest thing is still the child’s imagination.